Dr. Mary Swift founded Dallas Laser Dentistry in 1997. She and her staff have won numerous awards over the years for both dentistry and community service. Her focus on patient service has helped change the way modern private practice dentistry operates in Dallas. Mary Swift Cosmetic Dentist of 2011 and 2012 according to Consumer Choice Dallas from Patrick Dougher on Vimeo. 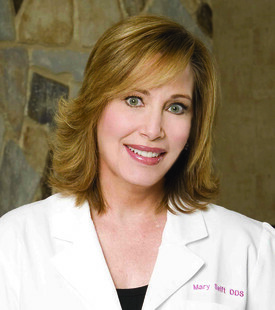 With over 30 years in the dental profession, Dr. Mary Swift is known for her advanced dental and cosmetic techniques, which she continues to improve with hundreds of post-graduate course hours. Dr. Swift and her staff at Dallas Laser Dentistry have received the Consumer's Choice Award for Cosmetic Dentistry the last seven years, and Dr. Swift was named by Texas Monthly one of their “Super Dentists” for 2014 -2017. She has been profiled in "D" Magazine, New Beauty, and Dallas Modern Luxury, and was named by readers of North Dallas Living as 2014 Best Dallas Cosmetic Dentist. After being trained in 2004 in the use of BOTOX® to treat TMJ headache pain, she has become nationally renowned, with patients from all over the U.S.
With her patients, Dr. Swift is known for her caring and educational approach, her ability to listen to each patient's desires, for involving each patient in the development of their own unique treatment plan, and for her customized smile creations that optimize each patient's facial bone structure and personality. Dr. Swift builds smiles that not only are contagious, but that are designed to last. Without a good foundation a smile, just like a house, will not last as long as it should, so Dr. Swift makes sure that both oral health and teeth alignment are optimized before cosmetic work is placed. Relax in a soothing, spa-like environment overlooking North Dallas, complete with massage chairs and aromatherapy, while Dr. Mary Swift utilizes her extensive experience, laser technology, advanced training, and aesthetic skills to analyze and create a smile uniquely designed and ideally suited to your face. The result is a dazzling smile that is absolutely contagious! We know you have a choice when selecting either a Dallas cosmetic or general dentist. As a result, we do everything we can to make this a most pleasant experience. We've constructed an environment designed to relax and pamper you. Each operatory has a view from eight stories high of North Dallas. Heated massage pads in each chair, eclectic music, warm scented towels, and educational videos make the time pass comfortably. Our female dentists, hygienists, and assistants have been carefully chosen not only for their professional skills, but also for their ability to put patients first and at ease.